Remember that boom box from the placeholder video for Eminem's"Berzerk?" Well, that thing has been blown up to 100 times its size in the final clip for the first single from Slim Shady's highly anticipated upcomingThe Marshall Mathers LP 2. Em gave a sneak peek at the finished product during an unexpected appearance on ESPN's College Football Prime Time on Saturday night, one of the first times in recent memory that Slim Shady has done live TV. Opening with what looks like an old-school VHS tape title card, the preview finds Eminem, in a white t-shirt and khakis, in full throwback mode, attacking the fish eye lens while rapping, with bearded producer Rick Rubin silently by his side in all black. A quick cut shows the rapper in a T-shirt featuring Run-DMC and the Beastie Boys, the first groups to use the hard rock-meets-rap sound that Rubin pioneered with Def Jam Records more than 30 years ago. The Beasties, of course, are sampled on the track (along with 1980s rocker Billy Squier), and much of the video is a kind of homage to their legendary visual style. Looking energized and feisty, Em raps right into the lens, waving his arms across the screen and throwing on a Pistons Jersey and matching beanie for a shot that apes one in the B-Boys' "So What Cha Want" video. 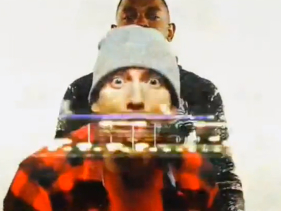 At one point, Em is shoved out of frame by guest Kendrick Lamar, who lip synchs some of the lyrics. (Longtime pal Royce Da 5'9 and the members of Slaughterhouse also make cameos in the teaser.) The preview ended with a visual reference to the Squier video and a shot of Em and Rubin staring into the camera blankly as the video tape runs out. Veteran sports announcer Brent Musburger, who kept referring to Em by his real name, Marshall Mathers, said it was an "honor" to have the rapper on board, noting that "Berzerk" will serve as the show's theme song all season. "Mathers, it's a pleasure," he told Shady, who looked wide-eyed while wearing an announcer's headset with microphone. "It's a pleasure to be here and it's an honor to be here with you guys," Em told hosts Musburger and co-host Kirk Herbstreit, who he joined in their studio during the broadcast of the Michigan-Notre Dame game. "What are you most excited about with this new album," Herbstreit asked. "Um, nothing," Shady said while messing with his headset. "No. It'll be out November 5. I'll probably be most excited to be done with it," he added, noting that it's a "re-visit" of the first Marshall Mathers LPfrom 2000. After praising Musburger for being a broadcasting legend and sharing his line-up for a Lions Super Bowl broadcast dream team, Em got a bit squirmy when the Mus reciprocated the love. "You're the legend my friend," Musburger shot back. "13 Grammys, first rap song to win an Academy Award ... you've sold 100 million record worldwide ... you, my friend are the legend!" Looking shocked, Eminem responded, "I'm really uncomfortable right now."